A harder walk over coastal heathlands via Damage Barton and Bull Point Lighthouse. One of the most rewarding routes for the more ambitious walker follows inland footpaths across areas of the rugged coastal heathlands, passing several ancient hill farms and returning along the spectacular North Devon Coast Path. This is not a route to be attempted by the unprepared; some stretches are extremely marshy and there are several very steep inclines. It is a long and fairly arduous walk, possible to complete within 3 hours, but best extended to a more leisurely 4-5 hours to take in the village of Mortehoe, where well-earned refreshments can be enjoyed at the half-way point. 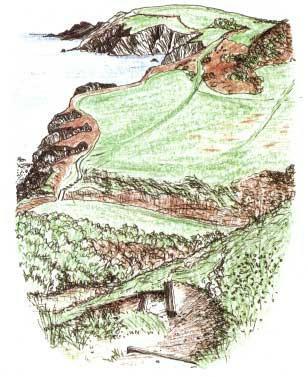 The scenery is varied, including the ancient broadleaved woodland of Borough and Six Acre Woods (see Walk 3); windswept farmland, where the native heath has from centuries past been cleared for grazing; and of course the incomparable splendour of the rugged cliffs and coves which give the North Devon Coast its unique character. Two very different buildings are of particular interest: the ancient Damage Barton Farmhouse, beautifully preserved in its sheltered combe above Damage Valley; and, perched on its rocky headland, Bull Point Lighthouse, now fully automated but still open to the public. 1. From the car park near the sea front take the footpath which runs inland (away from the cove). Follow it to the far end of the meadow where there is a stile on the right. Cross the meadow to another stile leading into Borough Woods. 2. Go over the footbridge and turn left, following the stream through woods for about 1 mile; after the stockproof gate (The driping well can be viewed on the right of the path about 40 paces before the gate) take the (higher) right-hand path to Damage, climbing steeply until you reach a stile leading into a field. 3. Cross the field (Compass 285 degrees) to a stile leading into a lane; go straight over this to steps in the bank and another stile into a field. Take a beaing of 300 degrees. A footpath sign is visible high up over the far side behind the hedge. Make for this and go over the stile in the right hand corner of the field. 4. Bear right and head for a gate with a footpath sign (roughly in the direction of the sea), then follow the yellow waymarker arrows through a marshy area between gorse and rocky outcrops. Where another footpath is joined (new sign erected here) bear left (290 degrees) to a low stone wall. 5. Go through the small gate into Damage Barton Farm, turn right as indicated by the arrows, then follow the path as it winds around the farm buildings and down to a waterfall and pond. 6. Follow the lane uphill to the bend where there is a gate on the right with a small sign to Mortehoe. Go along the hedge to a stile into another field, and continue alongside the stone bank to a gate and track leading to Yarde Farm. After passing a Barn on the left continue straight on for a short distance until reaching a area of grass. Turn left here and follow a grass path to the pond. Follow the footpath arrows which will tale you through the centre of Easwell Holiday complex (formally the old Easwell Farm) After passing through the buildings continue on the tarmac road which leads straight ahead. Continue until you reach a five bar gate. 7. When you come out on the road turn right and go through the gate into the private lane which leads direct to Bull Point Lighthouse. (Or take alternative route, see note below) Continue on this tarmac lane until reaching the lighthouse. Along this lane you will find two options (on the right hand side) to take a path down into the valley floor, thus avoiding Bull Point lighthouse. If you deside to take this option turn left on reaching the valley floor and continue to Bennets Mouth. The coast path to Lee can be joined here. 8. From Bull Point Lighthouse return along the Coast Path over the splendid cliffs back to Lee; when the footpath ends turn left into the lane and continue downhill towards the cove car park. Can you spot the following? And how many coves can you count on the coast path? .In September 1972 the light house had to be rebuilt after a cliff fall caused extensive damage. In July 1975 the station was automated, changing it from a 3-family lighthouse to a “keeper and his wife” station. 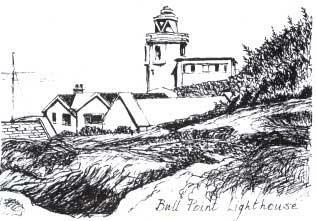 In 1995 it was officially de-manned, although the keeper continues to live at Bull Point as an attendant. The public are admitted at his discretion to view certain parts of the lighthouse on weekdays from one hour after noon to one hour before sunset. The light has an 800,000 candle power, flashes 3 times every 10 seconds, is 55 metres above sea level and has a range of 19.7 sea miles. The foghorn which was also automatic and gave a one 4-second blast every minute was discontinued in 1988. This ancient farmhouse stands on what was once the road between Lee and Mortehoe and is now a rough track. The present building probably dates from the 16th or 17th century. Above the doorway to an outbuilding is the date 1656 but some structures may be even earlier and there is evidence of a dwelling here in medieval times. A barton is the name given to the most important farm in a parish and derives from the O.E. “beretun” meaning “barley yard” or “enclosure”. It has been suggested that Damage may have been the name of an earlier owner. Damage Barton was for many generations the home of the Cutliffe family who in medieval times were the lords of the Manor of Lincombe and Warcombe. The coat of arms of the Cutliffe family depicts three pruning hooks which, it has been suggested, might have been used as a defence against pirates. This idea, however, appears to have no more substance than another story that the Cutliffes were descended from smugglers, named after cutting a tunnel into the cliff to hide contraband. What is certain, however, is that the Cutliffes eventually married into the Drake family, becoming known as the Drake-Cutliffes, who built the Manor at Lee on the site of what is now the Lee Bay Hotel. Many bartons of the 16th and 17th centuries appear to have been fortified against attack. Damage Barton itself is built of local Morte slate and consists of a tall screen wall with a massive gate enclosing a cobbled courtyard. One of the buildings was a mill house, in use until the 1950s. At one time the owners kept a pack of hounds in what is still known as the kennel yard. Surviving on the Coastal Heathlands. The thin, acid and stony soils, swept by salt winds from the Atlantic, are an inhospitable habitat for all but the hardiest of plants such as gorse and heather. But man also needs to survive and his efforts to feed himself have, over the centuries, caused many changes in the landscape of these coastal heathlands. In particular the gorse and heather have been cleared for rough grazing and some stones have been removed for building and to construct walls and sheep pens which are still visible at several points along this route. The gorse and heather, once cleared, had their own uses. Gorse was cut for heating bakers’ ovens; several old clome bread ovens have been discovered in the walls of local farmhouses. Gorse, or furze, was also used in lime kilns where the lime brought in by boat from Wales was prepared for agricultural use on the farms. An old country saying claims that when gorse is in blossom, kissing’s in season”; interestingly there are few times of the year when there is no blossom visible! Heather was used for thatching ricks, and the flowers of both plants would have produced excellent honey, much used in the days before imported sugar. It was also the custom to “swaile” the heath–that is to deliberately burn it as part of the land management. Food supplies from the land were augmented by those from the sea. Lobster pots were made by locals for generations, using willow or hazel twigs from the Borough Valley Woods. Limpets supplemented the diet of many coastal families and it was not unusual to see mounds of limpet shells outside cottages. Laver–a seaweed rich in food value–was gathered from the rocks at low tide. It can still be obtained today, more conveniently, from shops in llfracombe and Barnstaple. The present farmhouse is thought to date from 1622 but the 1330 Subsidy Roll mentions the home of William atte Yurd (probably from the O.E. “gyrd” meaning an area of land). In the 17th century this was the residence of the Vicar of Mortehoe. It has since been a farm and more recently a successful holiday complex. There was once a tithe barn, stepping stones across the stream and a wishing well.